We speak to Michel Rouzic, the developer behind Photosounder, SplineEQ and Spiral. Tell us about your background as a programmer and a musician. "When I was 13, I learnt BASIC, made a Vigenère cipher program, then nothing until I went to college and learnt C while skipping class. My first project was what eventually became Photosounder. "I don't have much of a background in music - I had piano lessons when I was a child, but I feel like it didn't teach me anything besides the fact that sheet music is unnecessarily complicated. "I consider myself an outsider, and I use that position to make sense of music as a complete outsider would, by creating tools to analyse music and learning from the analysis and finding ways to make sense of it." What was the inspiration for the Photosounder program? "I thought we sorely lacked a way to directly transform or create sounds. We have all those effects, but they are so limited in scope that I thought we needed one way to do everything possible, and for that, image editing was the inspiration. "I wanted people to use Photosounder to make music - real music - by learning what sounds are made of graphically. That never happened because while Photosounder was designed to be able to make any possible sound, it wasn't designed to help you do it. "Perhaps more crucially, we collectively lack the knowledge of how to design sounds graphically. In a way, Photosounder is MS Paint in a world where no one knows how to draw anything." Which feature are you most proud of in your software? "I'm quite proud of the way Photosounder can resynthesise sounds from images - you can even print out a sound, then scan it and play it. Sure, there are artifacts that bother me, but it still sounds pretty amazing in extreme slomo, much more so than most timestretching algorithms. Which makes me pretty happy about Photosounder's new live synthesis - it gives you a glimpse of how great the potential of graphical sound creation in real time is. "Right now I'm quite infatuated with Spiral's stereo pan visualisation"
"However, right now I'm quite infatuated with Spiral's stereo pan visualisation. I can see and learn how music is made, and not just the notes but everything from spectral content to stereo mixing. You can see it all in a pretty real way, from the audibly imperceptible wobble of tape to the way a guitar player bends strings. 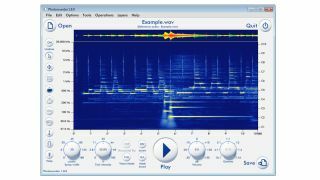 It's nothing like analysers with only clean, aseptic vector graphics - it's rather gritty in how it shows the sound as it is." "I'm hard at work on the full version of Spiral [the 'daddy' of Computer Music's own Spiral CM]. I'll also have to work more on SplineEQ, both on a somewhat minor update and a major new version. "And then I want to do something radical with Photosounder, turning it into something more practical for making music and experimenting with sound synthesis, with a workflow more familiar to modern DAW users, and my own vision of how FM synthesis should be handled. But don't hold your breath - it still requires a lot of figuring things out before I can even start working on it."